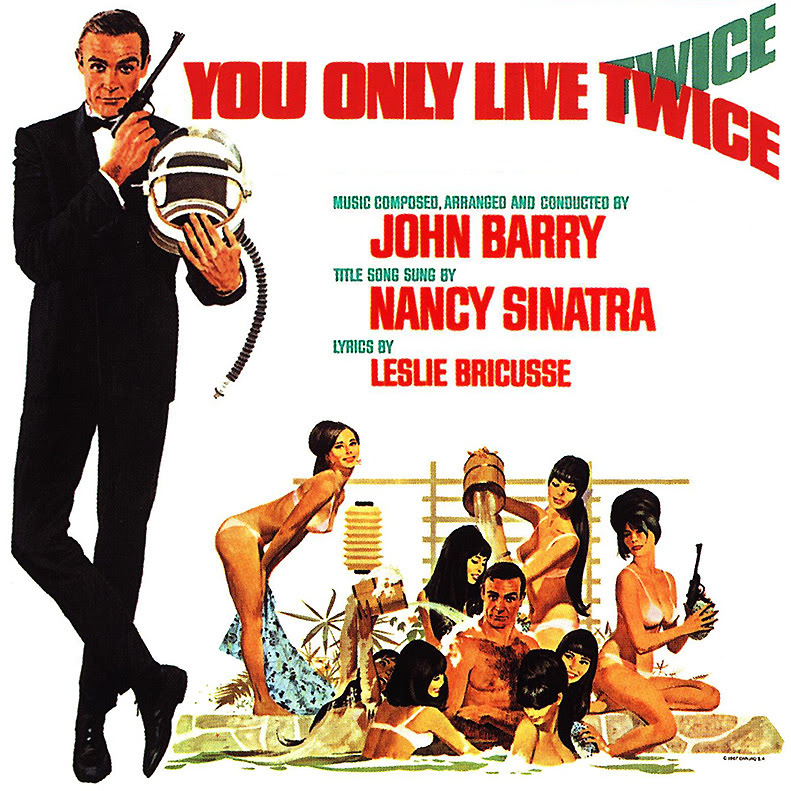 You Only Live Twice (1964) by Ian Fleming was published some eleven years after his first James Bond book, Casino Royale, and five months before Fleming would die on August 12, 1964. Compared to the scope and achievement of Casino Royale, You Only Live Twice is a poor narrative with some brief bright points. It is no surprise since You Only Live Twice comes at the tail end of Fleming’s career arch and after the international success of the early books and films (the first film being Dr No in 1962 – which is the sixth book in the Bond series). In the previous book, On Her Majesty’s Secret Service, Bond’s wife is killed. At the opening of You Only Live Twice, Bond is in a deep depression and is neglecting his duties in the office. M decides to send Bond on an impossible mission in Japan to either get the old Bond back or to finish Bond for good. To sum up, an enormously rich expat has popped up in Japan and through legal means created a ”Castle of Death”. Hundreds of Japanese who wish to commit suicide flock to this ”death collector” and Bond is to put a stop to it once and for all. The villain turns out to be Bond’s old nemesis, Blofeld. Most of the book is a cultural expose on Japan, which does have its moments, but this book as it is would not be published as a new book in today’s market (where Casino Royale most certainly would be). In You Only Live Twice, many chapters are dedicated to great expositions inserted into dialogue, often by Bond’s Japanese contact Tiger Tanaka, on the Japanese way of life, including honor, suicide, samurais, and the plot of the story–this mysterious ”Collector of Death”. Personally, I enjoyed the ”information dumps” (a popular phrase used by one of my most esteemed writing mentors) but, when compared to Casino Royale, these dumps drag the story down and impede pacing. In Casino Royale dialogue is kept to a minimum of a few finely crafted sentences. In You Only Live Twice, Tanaka rambles on for pages at length. If you are interested in Japanese culture (circa 1960s) then this book might be of some appeal to you. ”Kissy’s crawl was steady and relaxed and Bond had no difficulty in following the twinkling feet and the twin white mounds of her behind, divided excitingly by the black cord. But he was glad he had donned the flippers because the tug of his floating container against the wrist was an irritating brake and, for the first half of the swim, they were heading diagonally against the easterly current through the straits. But then Kissy slightly changed her direction and now they could paddle lazily in towards the soaring wall that soon became their whole horizon” (p 201). Fleming’s descriptions and images are as strong as they were in Casino Royale, and it is only the depth of the plot as ”espionage thriller” that lacks any real amazement or interest in You Only Live Twice. ”Her arms and legs were longer and less masculine than is usual with Japanese girls and, the day before, Bond had seen that her breasts and buttocks were firm and proud and that her stomach was almost flat–a beautiful figure, equal to that of any of the star chorus girls he had seen in the cabarets of Tokyo… But it was the charm and directness of her eyes and smile as well as her complete naturalness–for instance, when she mopped at Bond’s face and chest–that endeared her so utterly to Bond. At that moment, he thought there would be nothing more wonderful than to spend the rest of his life rowing her out towards the horizon during the day and coming back with her to the small, clean house in the dusk” (p 182). It is as though Fleming is attempting to write Bond’s final love story, but pulls back the reins suddenly to dispose of Blofeld in a matter of a few pages and to return back to Kuro Island to be with Kissy. The world, including Tiger Tanaka and the British intelligence service, believe Bond has died in the assassination attempt that completely destroyed the Castle of Death and Blofeld. Kissy, however, saved Bond from drowning and ushered him secretly to a cave on Kuro Island where she has decided to heal Bond and make him her husband. Bond, meanwhile, suffers amnesia with vague nightmares of his past life as a spy and believes he is a simple fisherman. ”Winter slid into spring and fishing began again, but now Kissy dived naked like the other girls and Bond and the bird dived with her and there were good days and bad days. But the sun shone steadily and the sea was blue and wild irises covered the mountain-side and everyone made a great fuss as the sprinkling of cherry trees burst into bloom, and Kissy wondered what moment to choose to tell Bond that she was going to have a baby and whether he would then propose marriage to her” (p 272). ”Kissy’s heart choked her. She got up and walked slowly down to the boat. She pushed the boat down the pebbles into the water and waited, at her usual place in the stern, for him to get in and for his knees to clasp hers as they always did. ”James Bond took his place and unshipped the oars, and the cormorant scrambled on board and perched imperiously in the bows. Bond measured where the rest of the fleet lay on the horizon and began to row. ”Kissy smiled into his eyes and the sun shone on his back and, so far as James Bond was concerned, it was a beautiful day just like all the other days had been without a cloud in the sky. ”But then, of course, he didn’t know that his name was James Bond. And, compared with the blazing significance to him of that single Russian word on the scrap of paper, his life on Kuro, his love for Kissy Suzuki, were, in Tiger’s phrase, of as little account as sparrow’s tears” (p 274). A fine ending to any novel, and for Bond as well. Bond, however, continues in The Man with a Golden Gun. As for You Only Live Twice, I would have liked to have seen this book end the Bond series (as many Bond critics might agree). The world believes Bond is dead. He is at peace with a beautiful woman on a remote island. Much of his sad life has been erased. And there is a child on the way (regardless, Kissy’s narrative thread is effaced from The Man with a Golden Gun — so don’t go pick up that book expecting to find out what happens to Kissy and Bond’s heir). All in all, You Only Live Twice is a beautifully written love story and a poorly written spy story intertwined as one. I recommend this book to those who would like to learn about Japan and read a love story. I do not recommend this book for those desiring to read a James Bond thriller. Nevertheless, Fleming’s writing is something to be admired. Whаt’s up, I read your blog on a rеgular basis. Your writijg style is witty, keep up the good ԝork! My family all the time say that I am wasting my time here at net, but I know I am getting experience all the time by reading such nice articles. Thanks for finally talking about >You Only Live Twice (1964) by Ian Fleming | C.G. Yes! Finally someone writes about earbuds. Another strong and powerful post. I? ?ve been reading by way of several your previous posts and finally decided i would drop a touch upon this one. be a taboo matter but typically people don’t talk about these subjects.